Maurice-Antoine Falconet, active at Sèvres 1755-1766. The figure of Cupid was originally conceived in marble by Falconet in 1755 and exhibited at the Salon of that year. When he became director of the Sèvres porcelain factory in 1758, Falconet adapted the model to be executed in biscuit porcelain. The figure of Psyche was conceived as a pendant to Cupid in 1761. It was never executed in marble. 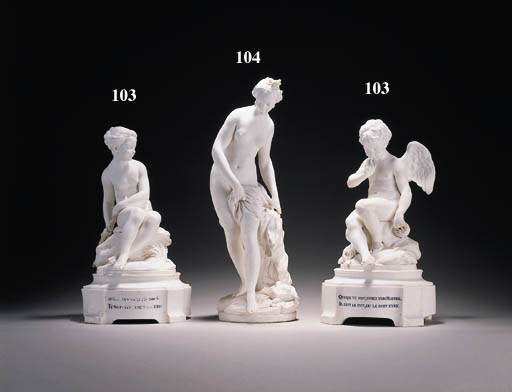 The bases for these models were designed for them in 1761. The present examples are inscribed with a couplet written by Voltaire. Cupid's reads QUI QUE TU SOIS, VOICI TON MAITRE/IL L'EST, LE FUT OU LE DOIT ETRE (Whoe'er thou art, thy master see/He is, or was, or ought be). Psyche answers NON, PAS PLUS QUE TU N'EST MON MAITRE/TU L'ES, LE FUS OU LE DOIS ETRE (My master thou art not, nor has been/As master of mine shalt ne'er be seen). Examples are also known with couplets from Virgil on the reverse: OMNIA VINCIT AMOR (Love conquers all) for Cupid and ET NOS CEDAMUS AMORI (Let us too yield to love) for Psyche. The bases are often glazed, with the inscriptions reversed against a variety of ground colours, most often bleu lapis. Several pair of biscuit figures on the original bases are known including the pair in the Wallace Collection on bases elaborately gilt with caillouté and trellis patterns and another similar example from the collection of Elizabeth Parke Firestone, sold Christie's New York, 21/22 May 1991, lot 137. A third pair raised on ormolu pedestals in the Wrightsman Collection, Metropolitan Museum of Art. A pair without bases is in the British Museum (1948, 12/3, 36/37).